Hello Everyone, I am back sharing products from Wplus9 the old and the new. If you have been following me, you know I love to mix and match. If you have not seen the new February 2015 released here is the LINK. 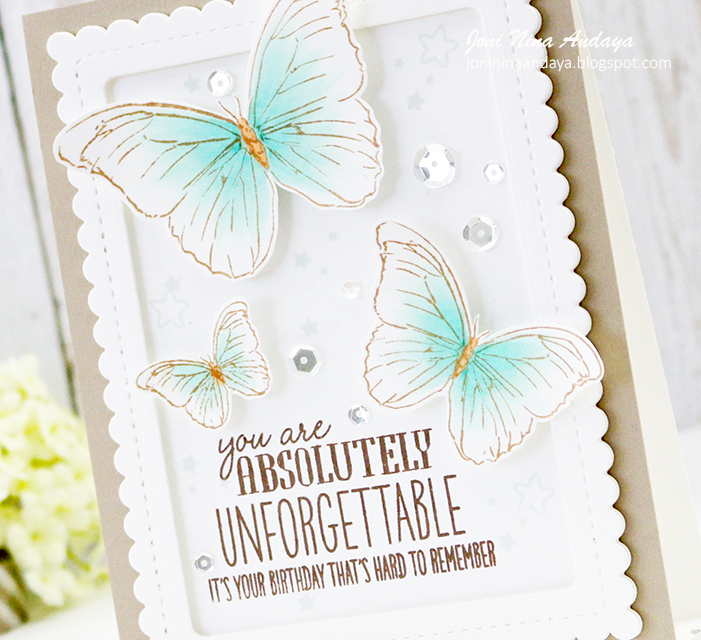 I really love the versatility of the scalloped stitched frame from the Sunshine Layers Die set, the beautiful butterflies from the Flora & Fauna 2 stamp set, and the fun sentiment from the Unforgettable stamp set. To begin, I stamped the butterflies in Wplus9 Coconut Husk and colored the butterflies with Copics in BG15, BG10, and Y35 for the middle of the butterflies. I then fussy cut each one, and adhered on the panel I die-cut using the Sunshine Layers Die. I die-cut the Sunshine Layers Die one time for the backing and the second time with frame. Next, I stamped the sentiment from the Unforgettable stamp set using dye ink ink Coconut Husk. I also added some stars from the Unforgettable stamp set its very faint in the background, I used the new released Wplus9 dye ink in Fairy Dust. The frame was adhered with foam tape for dimension as well as the butterflies. For the final touch I adhered some Pretty Pink Posh sequins in Sparkling Clear in 4mm, 6mm, and 8mm. WOW Joni, this is so gorgeous. I love how you've framed it all in. Just beautiful. So beautiful and delicate Joni!! Love your butterflies to bits! This is so gorgeous! Love how you colored the butterflies! I love that soft shade of aqua on your butterflies and that sentiment is wonderful! Soooooo beautiful! LOVING the butterflies!!!!!! This card is so beautiful!! I love it! OOOOOOOOOOOOOH this is pure magic and delight Joni!!!! I need this set cuz of you!!!! Love all that you do! OMWord, this is just the MOST gorgeous card, Joni! Love every little thing about this! Wow! What a stunning card Joni! Everything you make shines with beauty! This is just lovely! Oh my gosh this is stunning! Love the white and delicate feel to this card, Joni! Oh, this is so beautiful, Joni! I love it! Beautiful card! Love these butterflies and the note is so fun! Stunning !!!! I love the colors !!! This card is so beautiful! I love your Flora & Fauna 2 Cards!